Indianapolis-based smart vending machine supply company IVM wants to eliminate administrative hassles. 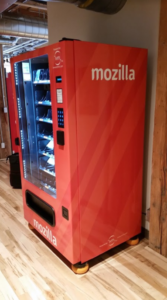 IVM has equipped several tech companies, including Facebook, Intel, Dropbox, Logitech, and HP, with vending machines that dispense common tech peripherals, like keyboards, computer mice and cables, as well as other job-specific equipment, like repair tools and safety equipment, to reduce the delay and headaches associated with ordering them. It also helps companies keep track of what supplies go where to keep costs predictable. Niq is an intelligent bartender who lives inside a motorized bartending station in the Y Media Labs offices. Niq’s brain resides inside an iPad app, and his body is an IoT-enabled set of motors and pumps powered by an Arduino board. Niq will recognize you when you step in front of his eyes, the front-facing iPad camera, just like a normal bartender. 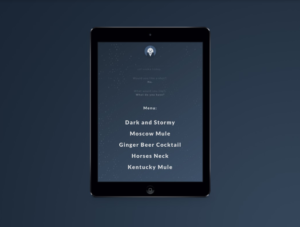 After recognition, Niq will speak to you in a British accent using a voice interface, and then can chat or recommend a drink, or follow your drink preferences. Unfortunately, Niq was specifically made by Y Media Labs during a hackathon — so he’s only available in their offices. 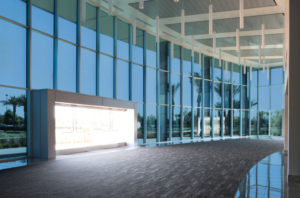 View Glass manufactures dynamic windows that tint electronically in response to the weather and position of the Sun; they are essentially transition lenses for buildings, and the windows’ tint levels can be changed through a connected smartphone app. The glass also connects with the building management system to adjust the heating and cooling as the conditions change. 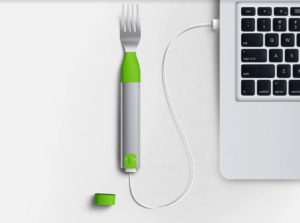 The Bluetooth-enabled HAPIfork is a smart fork, and pairs wirelessly with your smartphone or tablet to track, analyze and help suggest ways to improve your regular eating habits. It’s actually pretty useful; the implement will tell you if you’re eating too quickly and will encourage you to slow down before hitting work again, which is a definite win for most office workers. Are you hunched over your keyboard right now? Upright can fix that! Upright is a smart “posture trainer,” a wearable device you stick to your back that reminds you to sit up straight throughout the day. It also incorporates short training sessions and provides feedback on how your posture is improving. Livescribe is a pen/dictaphone hybrid for the IoT age that allows you to accurately digitize your notes on the go. 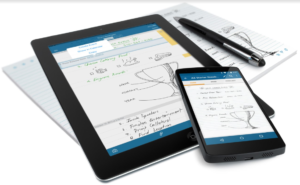 Livescribe connects to your tablet or smartphone using Bluetooth, syncing everything you write on real paper into the app on your paired device. 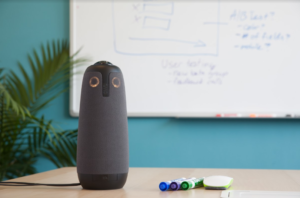 The Meeting Owl is an intelligent 360° video conferencing device that — you guessed it— looks like an owl. But don’t be fooled by its cute exterior — this device can pack a punch. The Owl learns where people are sitting in the room and automatically focuses the camera on the person who is speaking. It’s wifi-enabled, both so that Owl Labs can improve the intelligent software over time and so that the user can access the Meeting Owl app to manually control the focus of the camera. XANDEM is a smart sensor that monitors your office — without cameras. 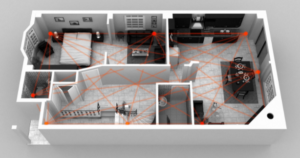 It’s a bit like Harry Potter’s magical Marauder’s map, showing your staff’s movements as they walk around your office. “Remember to bend at the knee!” Finally, those health and safety demos telling us how to lift a box are getting an upgrade. 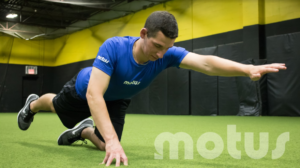 Motus Global is on the verge of launching wearable smart tech that’ll change workplace injuries forever. The motusONE system analyzes a person’s physical condition and wellness using four sensors inserted strategically in a shirt. For example, if an employee is doing some heavy lifting, you can look at data from different muscles and joints in the body to assess if the person is putting themselves at risk of an injury while doing the activity. Sick of your colleagues sneezing on you? 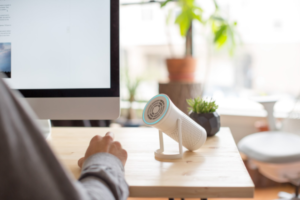 The Wynd intelligent personal air quality system envelops you in a bubble of clean air to stop you catching the office cold. It monitors your environment and cleans it as needed to remove dust, germs and other particulate pollution from your personal space.